La Nina generally forces the jet stream to take a more northern track from the Pacific Ocean through the U.S. This increases the chance of snow across the Pacific Northwest states like Washington and Oregon and also can decrease snowfall across southern states. El Niño might be the media darling of climate phenomena, but El Niño’s sister—fittingly called La Niña—is responsible for something that no skier should ever forget. During the 1998-1999 ski season, Mt. Baker in Washington recorded the most snow of any location in the world during a single season. That amount was 1,140 inches, or in terms you might be able to get your head around, 95 feet, which is about the size of a big pine tree in Washington. While La Niña is not directly responsible for this astronomical amount of snow, it definitely played a role. 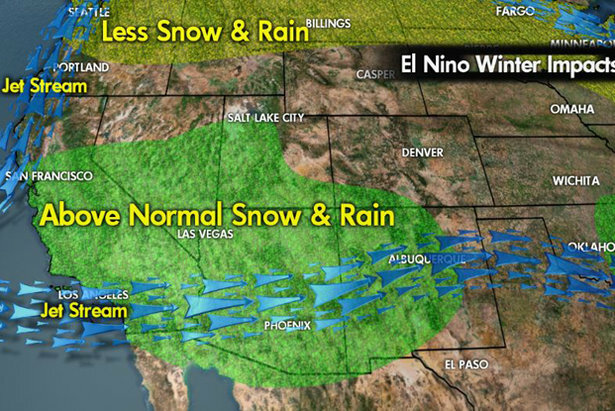 So let’s dig deeper into what La Niña is and how it affects snowfall across the U.S. In the late 1800s, Peruvian sailors nicknamed a warming of the ocean waters off the west coast of South America “El Niño” because it occurred around Christmas. However, because most things in nature tend to balance out, El Niño was not alone. An equal but opposite phenomena occurs as well, and this cooling of the ocean water was subsequently called La Niña. The technical definition is a cooling of the ocean of more then 0.5 Degrees Celsius (about 1 Degree Fahrenheit) for three consecutive months in an area along the equator from the west coast of South America further west toward the central Pacific Ocean. Okay, that’s a mouthful of a definition so simplify the details and think of it as a cooling of the central Pacific Ocean. La Niña by itself is an interesting scientific topic to explore, but more importantly for most skiers is the fact that La Niña can influence global weather patterns. A large change in ocean temperature across a large area of ocean will cause changes in weather patterns around the globe. Remember, the entire earth system is linked together, so oceans, land areas and the atmosphere all influence each other. Since the strength of La Niña (the cooling of the ocean) peaks during the northern hemisphere fall, winter and early spring, the effects on weather from La Niña also peak during this time. Some of these effects include wet weather in Australia and Indonesia, dry weather over Peru and the southern U.S., and a change in the jet stream across North America which influences the location of the heaviest snow. For the U.S., La Niña causes a more northern storm track that often brings higher than average snowfall to the northern third of the country and less snow to southern areas. For skiers, a medium to strong La Niña is almost a sure bet that the Pacific Northwest is going to have a great snow year, and this can extend north to parts of Canada and Alaska and into adjacent states like Montana and Wyoming. While there’s also a rather strong indication that La Niña years bring lower than average snowfall to the south, the hardest forecast to make is for areas that aren’t north or south but right in the middle, like Tahoe, Utah and Colorado. Many La Niña years treat these areas favorably with above average snow, but it’s not a sure bet. And some La Niñas can persist for two winters in a row, and often the second winter does not bring as much snow to this middle area as the first. Of course what type of meteorologist would write about the weather without throwing in a few caveats. The biggest caveat here is that La Niña is only one piece of the puzzle that controls which locations get the most snow in the winter. Other climate factors and the somewhat random nature of each individual snowstorm also control where the flakes fall, so while La Niña is something you should keep an eye on, don’t use it as your sole predictor of where the snow will fall in a given season. However, If you want a shot of skiing during the next record-breaking season at Mt. Baker, make sure it’s a La Niña winter. El Niño can occur every few years. Here's why skiers and snowboarders should care.